The faith based genre of films have become more popular lately preaching to their choir. The films are generally centered around a crisis that is over come by their religious beliefs which is all fine and good, but sometimes the message is like a 2x4 across the head. In this new feature based on a true story about a blind high school football player is directed by character actor Dylan Baker working from a script by Bram Hoover (who also stars in the film) and Toni Hoover. The result a little like the average Lifetime movie of the week, with an low budget quality, awkward acting and stilted dialogue. But the film still won the 2013 Heartland Flim Festival's Audience Choice Award for Narrative Feature, so the feel good element works despite it's weaknesses. 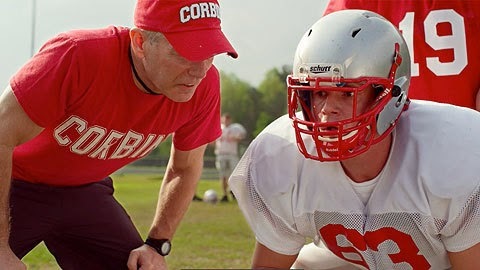 Travis Freeman (Mark Hapka) and his best buddy Jerry Baker (Bram Hoover) grew up together playing football in Corbin, KY. In high school they are a winning combination with Travis winning more accolades for his sportsmanship. The small town community is obsessed with it's Friday Night Lights and winning the championships which is under the direction of Coach Farris (Stephen Lang). Life is good and picture perfect until Travis loses his sight to bacterial meningitis. As a teen, this is like a major setback from being top rock star to being pathetic. Even his cheerleader girlfriend drops him like a hot rock. Travis sulks in his room until his rehabilitation coach Patty Wheatley (Becky Ann Baker) starts giving him some tough love while training him to maneuver around the school and the streets. His best friends Jerry and Ashley (Alexa PenaVega) also try to not judge and keep things upbeat for him like Jerry letting him drive his truck. Meanwhile the team is faltering without their star player so Coach Farris suggest to Travis that he should come back on the team playing center. Of course everyone thinks this is a disastrous idea especially the school's recreation director and vice principal Duncan (Timothy Bushfield) who wants to end Coach Farris anyway he can. The rest of the movie is the rise and fall of Travis and his attempts to play football culminating in the final big game. There must be some small towns that scream Americana like Corbin, KY. Just a touch diverse, middle class, and everyone knows your name. Kim Zimmer (Guiding Light) and Dylan Baker play Travis' parents who are understanding and protective. Jerry is battling with confidence of always coming in 2nd to Travis so he self sabotages at crucial moments in the game. Max Adler (Glee) playing a footballer player again doesn't believe Travis will help the team being blind and all. Look for the real Travis Freeman showing up as a church preacher (which he is today) giving a message that speaks to fictional Travis that helps him over come his demons. Inspirational probably. TV movie definitely.